Enjoy each adventure in this Thor Motor Coach class C gas home on wheels. This Chateau model 28Z offers added comfort, including a large slide out in the living area, and rear bedroom featuring a queen size bed. As you enter notice how spacious it feels in this coach with the large slide fully extended. There is a jack-knife sofa to the right of the door including overhead storage. A cab over bunk above the driver area provides a bit more sleeping space that the kids will certainly love. Across from the entry door is a Dream dinette, double kitchen sink, and a three burner range-top with microwave oven above. The slide creates a roomy interior with plenty of space for everyone to move around. Both the sofa and dinette can easily be made into more sleeping space when needed. There is also a refrigerator located just off the slide next to the range.A 40″ LED TV is centrally located for viewing from the sofa, dinette, or cab over bunk. There is a convenient bath that features a shower, toilet, and large vanity with sink. Plus, you will like the large overhead cabinet for towels and toiletries. The rear bedroom gives you a bit more privacy and features a 60″ x 74″ bed. There are also dual closets, an overhead storage cabinet, and an optional 32″ LED TV. If you like watching your favorite game or shows under the stars, choose the optional exterior 32″ LED TV. 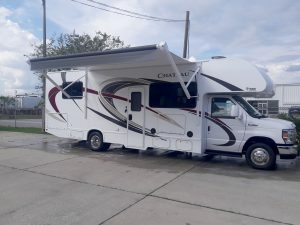 Live IN the Action making memories with an RV from Suncoast RV Rental, Florida's premier RV rental a...gency for more that 14 years. Specializing in RV's for personal and family recreation, entertainment productions, corporate hospitality, offering RV's from beginner Class C's to Diesel Pushers. Sharon will meet you at the location you choose for pickup and return.